Born in Moscow on October 2, 1954. EDUCATION A graduate of the Moscow Automobile and Road Construction Institute, he also received MBA-degree at the International Business School of the Moscow State Institute of International Relations (MGIMO). PROFESSIONAL ACTIVITIES Sergey Katyrin took an active part in the establishment and development of the Chamber of Commerce and Industry of the Russian Federation, which held its founding Congress on October 19th, 1991. In 1991 he was appointed director of one of the Chamber’s departments. In 1992 he became the CCI of Russia’s vice-president and came to sit on the General Board of CCI Russia. Sergey Katyrin was elected President of the CCI of Russia at the Chamber’s 6th Congress in March 2011. Sergey Katyrin’s range of activity as the CCI of Russia’s President includes effective coordination within national chambers of commerce and industry network, which incorporates territorial chambers of commerce and industry, associations and business unions. Establishing productive cooperation with legislative assemblies and executive authorities at both national and regional levels marks yet another area of his daily concern. 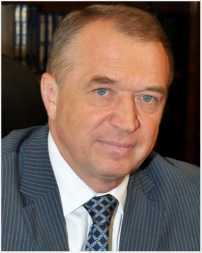 Sergey Katyrin represents the CCI of Russia in major business unions where he is among the board members. He sits on the government’s Commission for the Development of Small and Medium Businesses, is a member of the Public Council for the Development of Small and Medium Businesses and has a membership in a number of equally important public and advisory councils. Sergey Katyrin is the Chairman of the Russian Chapter of the BRICS Business Council, the Chairmen of the Russian Chapter of the Shanghai Cooperation Organization Business Council, the First Deputy Chairman of the Russian National Committee for Pacific Economic Cooperation. He is a member of the Committee of the Chief Executives of CIS Chambers of Commerce and Industry. From 2006 to 2012 Sergey Katyrin served as Deputy Secretary of the Russian Public Chamber. He is a holder of the Merit Order of the 4th Degree, the Friendship Order, the Medal for Labor Valor and a number of other state and public awards. CHAMBER OF COMMERCE AND INDUSRTY OF THE RUSSIAN FEDERATION PROFILE The Chamber of Commerce and Industry of the Russian Federation (CCI of Russia) is a non-governmental, non-profit organization which represents the interests of small, medium and big business and encompasses all sectors of economy. The system of the CCI of Russia comprises 177 territorial chambers, over 200 federal unions associations, 500 regional business associations and about 50 000 enterprises. CCI of Russia incorporates 34 committees in various business areas and more than 1 000 committees formed by territorial chambers. CCI of Russia promotes the activity of more than 70 business councils on cooperation with foreign countries. CCI of Russia has a network of foreign representatives (including honorary representatives) that covers more than 35 countries over the globe and more than 10 CACCI Primary Members States. CCI of Russia provides services to foreign companies such as organization of trade missions, market analysis, promotion of companies and invest, search of business partners, due diligence, information services and legal consultations, intellectual property protection, execution of documents related to foreign economic activity, authenticates force majeure circumstances, trade and port customs and other services. World Trade Center Moscow and Expocentre (the largest exhibition center in CIS and CEE region) are well known in Russia and abroad. To assist business in dispute settlement International Commercial Arbitration Court, Court of Arbitration for Resolution of Economic Disputes, Maritime Arbitration Commission, Court of Arbitration for Sport, Association of Average Adjusters, Panel of Mediators in Conciliation Procedures operate under CCI of Russia. The resolutions of named entities are eligible all over the world. CCI of Russia is a member of WCF ICC, Council of the Chairmen of CCI in CIS, Eurochambers, CACCI and other international and regional organizations. In June 2012 Strategy of development of the system of CCI of Russia up to 2020 was adopted. It aims at strengthening Chamber’s position in Russian business environment and in particular further intensification of international activities and development of services rendered to business. For more information please visit www.tpprf.ru.